Yankees second baseman Robinson Cano has reportedly been signed to a 4-year, $30 million contract for the 2008-11 seasons, with options for 2012 and 2013 that could make the whole thing worth $55 million. Cano had three more years of arbitration eligibility, so this signing represents a departure from the Yankees' usual approach of waiting for free agency, which frequently requires them to pay top dollar and then some for their players. I was not that high on Cano when I saw him in the playoffs a couple of years ago, and you can read why in the second half of this post if you like. At the time, he almost never walked, flipped everything he hit weakly to left field, and was not making the routine plays at second base. Since then, however, his Isolated Power has increased slightly, and his Secondary Average (a way to measure how many bases a batter gains independent of batting average) has increased dramatically. This is a good sign, since batting average tends to be pretty fickle from year to year. In addition, Cano has become one of the better defensive seocndbasemen in all of MLB, at least according to Baseball Prospectus, +26 Fielding Runs Above Average, good for about two and a half Wins right there. All of that made Cano worth more than 9 Wins more than a replacement-level second baseman, which is usually MVP-voting territory. Alas, the voters do like their shiny objects, though, so Cano did not get any votes this year, as he did in 2006 when he hit .342, even though he was not as productive a player overall that year. Since he just turned 25, this keeps Cano locked up through his "prime years", his age 25 through 28 seasons, plus two more if they want him, and "only" a $2M buyout if they don't. Cano's walk has rate improved dramatically since his freshman campaign, from about once every 35 at-bats in 2005 to about once every 18 ABs last year, but that's still well below the AL average, which is about once every 10. He's demonstrated that he can turn on a pitch once in a while, and if the improvement in his defense is real, the Yanks should have themselves a key player at the Keystone for the next half a decade. 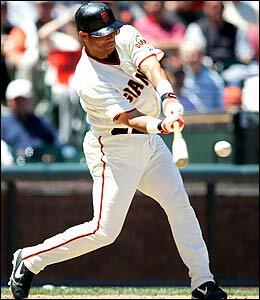 By contrast, the Phillies have signed San Francisco Giants' castoff third baseman Pedro Feliz to a two-year, $8.5 million deal. There's an option for a third year and performance bonuses that could net Feliz $15 million before the deal is done. Feliz has essentially two things going for him as a player: He's durable, having averaged about 152 games per season since the Giants made him a regular four years ago, and he's a decent fielder, with +9 and +14 FRAA the last two seasons, respectively. After that, the race downhill would rival one of Bill Cosby's go-cart racing stories. Feliz looks like he hits for power, because he's got 20+ homers the last four years, but really, he's average in that department. The average MLB thirdbaseman hit .273/.341/.442 with 21 homers and 89 RBIs last year. Feliz hit .253/.290/.418 with 20 homers and 72 RBIs. Lee Sinins rates him as 22 runs below an average MLB hitter, and Baseball Prospectus has him as -14. That's bad, either way, and his defense doesn't make up for it. Feliz doesn't hit for average, with a career .252 BA, and doesn't walk. His OBP last year ranked him #158 out of 162 players in MLB who got at least 502 plate appearances last season. In 2006, he was 157/160. In 2005 he was 146/148 and in 2004 he was 154 out of 161. That means he's never finished better than 8th from the bottom in OBP in any season in which he's been a regular, and this in the most important statistic in baseball. You just can't make up for that kind of poor hitting with your defense, not at a corner infield position. Feliz will be 33 in April, and is therefore past the point where we should expect him to improve, learn new skills, or in any way, well, get good. The irony here is that the Phillies already had Greg Dobbs on their roster, and have decided to keep him in spite of the signing of Feliz. Dobbs was picked up off the waiver wire from Seattle last winter, and played quite well for such a cheap acquisition, hitting .272/.330/.451, more or less just like I said he would, though he's nothing special with the leather. Still, when you've already got a 29-year old thirdbaseman who's worth about 3 Wins above replacement over the course of the season on the roster, making the major league minimum, why would you go out and find another thirdbaseman of similar worth, and pay him ten times as much to supplant someone of similar quality? Because no sane person charged with running a major league baseball team would want to do something that so obviously hurts the team, and I don't think that Phillies GM Pat Gillick is insane, I have to go with option number B. Maybe "stupid" isn't the best word, but "grossly underinformed" might be. OK, so that's two words. Why Gillick, who helmed the Toronto Blue Jays when they won two World Series back in the early 1990's, would do something like this is beyond me, unless he simply does not understand how important OBP is. Money to burn, I guess. Still, in some ways, this is par for the course with Philadelphia. They had a "hole" at third in that they did not have a "name player" at third, and even though there wasn't really anybody any good available on the free agent market, when the guys who actually were good were taken, they overpaid for an also-ran. If it doesn't work out, Gillick can, like his predecessor, Ed Wade, lament the over-priced, underproductive nature of the free agent market without taking any kind of accountability for helping to inflate those prices.